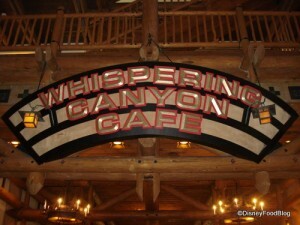 Whispering Canyon Cafe at the Wilderness Lodge Resort is one of Disney’s “funnest” restaurants ;-). With a crew of wayward servers with their minds made up to make you laugh, “pony” races around the restaurant for the kids (and possibly for some misbehaving adults…), and all-you-can-eat down home grub, this restaurant is a great one to book for a casual good time — especially if you’re with a group! All-you-can-eat breakfast, lunch, and dinner “skillets” to share among the table. Also, some great a la carte entrees and desserts! Disney Food Blog Review and Food Photos: Whispering Canyon Cafe Dinner at Disney’s Wilderness Lodge! You never know what’s going to happen at WCC — servers are on the lookout for ways to have fun with guests. Try to make a reservation for prime mealtimes. Things are most fun when the restaurant is full.